The book I couldn’t put down | Finding delight. Are you reading anything cool these days? 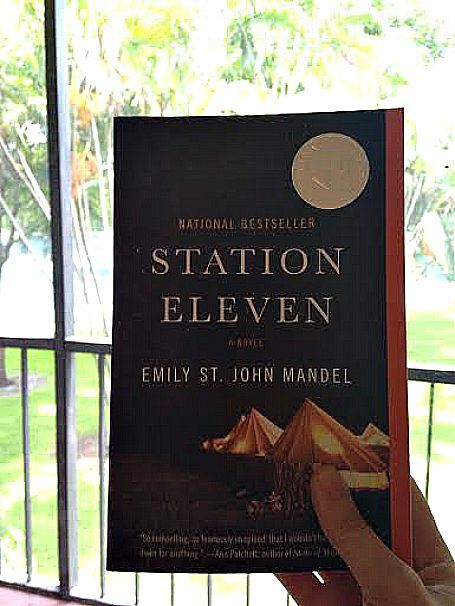 I just finished the book Station Eleven and L-O-V-E, loved it. Real talk: Y’all have GOT to read this book. Kickass novelist Emily St. John Mandel tells the tale of a traveling Shakespearean actress 20 years after a lethal flu pandemic sweeps across the world, leaving few left in its wake. Even if you’re not quite into dystopian/science fiction, I still think you’ll find this book a page turner as it’s pace, imagery and beautifully imagined intertwining cast of characters are all pitch perfect. Heroine Kirsten Raymonde is spunky and smart, and her, albeit fictional, story serves as a beautiful reminder of the ability of art to endure. I also loved how the plot skipped seamlessly before, during, and after outbreak of Georgia flu, leaving me looking for clues in the past and connecting dots between survivors. The subject matter is dark — death, the shady underbelly of survival, taking the creature comforts of modernity for granted — but the themes of hope and gratitude shine through throughout. I’d definitely recommend this book if you’d like to squeeze in one more delicious SUMMER READ before the seasons change. P.S. For links to some of Emily St. John Mandel’s essays CLICK HERE and for more summer read recommendations CLICK HERE. Pingback: Coffee date! | Finding delight. Pingback: Book Review: The Newlyweds by Nell Freudenberger | Finding delight. Pingback: My Birthday Book & Movie Haul | Finding delight.